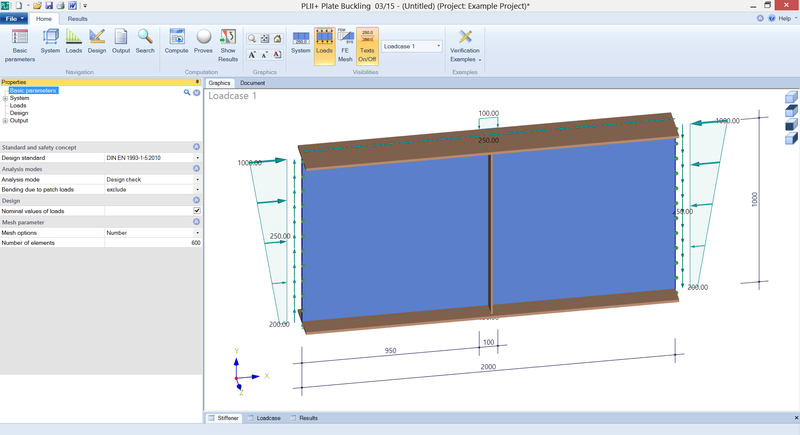 PLII+ is a calculation software for the analysis of rectangular plates with or without bracing that are exposed to user-defined actions on the edges. Besides the verification of the structural safety, the user can merely calculate the buckling load factors and buckling coefficients in accordance with the linear buckling theory. The calculation of the buckling field is based on the Finite Element Method (FEM) in this analysis. All examinations, including the calculation of the ideal buckling values, are performed on the entire field and include discrete longitudinal and transverse stiffeners. The effect of the stiffeners on the buckling behaviour is taken into account in all of these examinations. Therefore, verifications for individual or partial fields or an additional verification of the minimum stiffness of stiffeners can be dispensed with. Buckling on a member that behaves like an Eulerian column can also be considered for the entire braced field, if applicable. The loading described in item 3 and 4 allows you to map also variable bending and shear stress distributions in the buckling field by calculating the plate loading on a cantilever or a single- or doublespan beam pinned on two sides. For structures that are not handled in the selected design code (e.g. one or several unsupported buckling field edges), linear buckling loads can be calculated separately for all action components. This can optionally be done in an automatic calculation. By modelling flanges via the definition of edge stiffeners, you can also the examine buckling and lateral torsional buckling stability problems on deformed cross sections. PLII+ delivers the ideal buckling loads with consideration to local buckling in compressionloaded web areas. The results of such an examination strongly depend on the definition of the individual portions of the stiffeners’ stiffnesses and their contribution to the load transfer. 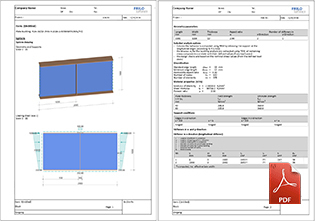 Special areas of application The PLII+ software is especially suitable for the verification of the buckling safety of welded beams with very slender webs. The buckling risk may be attributable to the entire supporting behaviour (loading by bending and axial force) and/or locally transferred loads as with craneway beams.